“I don’t have any of those toothbrushes that went to the moon,” says Dr. Ben Swanson, former president of the American Academy of the History of Dentistry. He was speaking from his basement, where he stores his trove of 40,000 artifacts related to dental history. Swanson once dreamed of owning every kind of toothbrush in existence, but ended up stockpiling only a few hundred. “I had to give up because there were so many of them,” he says. In fact, it would be nearly impossible to collect every specimen; the toothbrush is one of the most reinvented of human objects, with thousands of patents on file. The story starts in China during the Middle Ages, when people began grooming their teeth with animal bristles. Legend has it that centuries later, William Addis, generally recognized as the first to patent the toothbrush, served time in Newgate prison in London, where he whittled down a bone and stuck it full of bristles. Even when toothbrushes migrated to the corner store, many people preferred to rub their teeth with a rag. As late as the 1920s, “many Americans did not brush their teeth,” Swanson says. One reason is that those early toothbrushes could tear up your mouth — the tip of a boar bristle, under a microscope, resembles a spear. By the 1940s, synthetics offered a solution. One ad trumpeted: “For years, only hog bristle made fine tooth brushes. 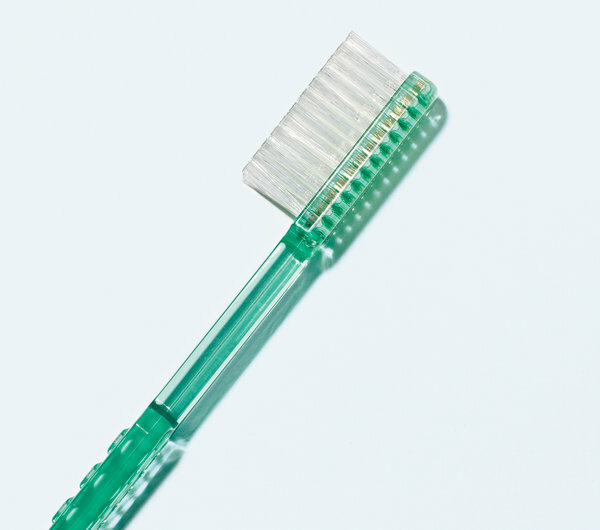 Then Science made round-end Prolon” — its soft bristles were designed to preserve the gums. The advent of plastics also meant that toothbrushes could take any shape imaginable. And so brushes jingled and hummed tunes. They arrived on the drugstore shelf enshrined in hermetic tubes. They boasted “anti-soggy” bristles. Asked to pick a favorite toothbrush from his collection, Swanson says he’s fond of a model that cleans both sides of the teeth at once. “You remember the Reach toothbrush with the angled head?” he says. “One year they came out with a brush that had two heads.” But the design failed to catch on. In the world of toothbrushes, apparently, two heads are not always better than one. You often carry a giant toothbrush to scrub away the decay that clings to public monuments. I’ve scrubbed many, many landmarks. I scrubbed the Kremlin back in ’98. We had a mandatory-toothbrushing parade; we had the text of the mandatory-toothbrush law translated into Russian. And we had like 30 Russians; we had musicians; we had the giant toothbrushes. The police came and told us to stop, and we stopped. It was a beautiful thing. So what would these mandatory-toothbrushing laws involve? Secret dental police. Government-issued toothpaste containing an addictive yet harmless substance. Computer-dental-chip implants to keep track of you and your children for your protection. For too long this nation has been suffering a great moral and oral decay.